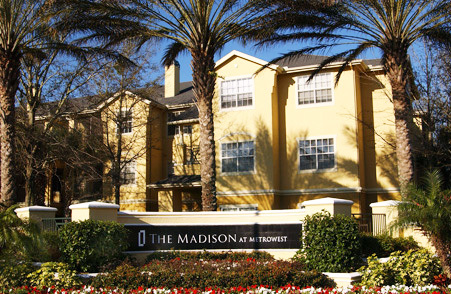 The Madison Condominium in MetroWest, is a private, gated, self-managed community that sits in the heart of one of Orlando’s favorite suburbs, just 10 minutes from downtown. Located on the Metro West golf course, the property enjoys lush landscaping and generous amenities, including a beautiful clubhouse, pool room, fitness center, sand volleyball court, resort-style swimming pool & spa, barbecue & picnic area, and a car care station. The Madison condos are located just a 5 minute drive from Universal Studios, 10 minutes from shops and restaurants of International Drive and a 20 minute drive to the gates of Disney.